Completed in 1987, the Sunshine Skyway is the world's longest cable-stayed concrete bridge. It is probably the best known of the several dozen cable-stayed bridges that have been built in the United States since the late 1970s. Its popularity may be due to its unique color -- its cables are painted a bright taxicab yellow -- but the bridge also boasts an interesting history. The need for a lower Tampa Bay crossing can be traced back to the 1920’s when a suspension bridge was proposed. However, it met opposition from shipping interests in Tampa, who wanted a tunnel instead. All ideas of a bridge or tunnel had to be put on the shelf when World War II broke out. After World War II the idea of a bridge was resurfaced. The need for a bridge was justified due to the traffic using the Bee Line Ferry as it was the only way to get to Bradenton and points south without having to make the long drive through Tampa. Construction began on the original Sunshine Skyway Bridge in 1950 and it was completed in 1954. The original bridge was a cantilever through-truss with a vertical clearance of 150 feet and a shipping channel clearance of 800 feet, which was adequate for ships of that era. One could admire the architecture of the major support piers on either side of the shipping channel as well as the three other support piers on the deck truss section of the bridge. Repair or replace? One side wanted the bridge repaired while the other side wanted a whole new bridge. After all, two way traffic was once again being maintained on the 1954 span. 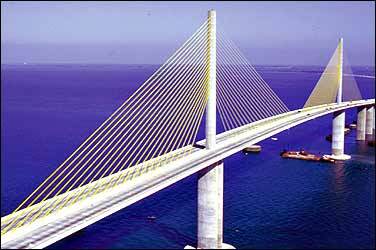 A decision was made to replace the Sunshine Skyway Bridge with a cable-stayed bridge modeled after a bridge in France. The Florida Department of Transportation began construction on a safer Sunshine Skyway Bridge only days later. More than 300 precast concrete segments were linked together with high-strength steel cables to form the roadway. Protecting the new bridge from ships was a big priority, so they installed large concrete islands, called dolphins, around each of the bridge's six piers to absorb unwanted impact. Since it opened to traffic in 1987, the sleek, new Sunshine Skyway has won dozens of engineering and design awards. In November 2005 the Sunshine Skyway was renamed the Bob Graham Sunshine Skyway Bridge in honor of the former Florida governor who made the right decision to replace the 1954 and 1971 cantilever spans with a new cable stayed bridge. · The dolphins around each pier were designed to withstand the impact of an 87,000-ton ship. · Twenty-one steel cables support the roadway. The cables are sheathed in steel pipes, nine inches in diameter. The pipes were painted a brilliant yellow to reflect its location: the Sunshine State. · Forty-foot-wide roadways run on either side of the cables. This design allows drivers to have unobstructed views of the water. · Tampa is a busy shipping port. To ensure that navigation would not be blocked, engineers designed the bridge to soar 190 feet above the water. 1. The Sunshine Skyway is probably the best known of the several world's longest cable-stayed concrete bridges. 2. The bridge is famous because of its colour. 3. More than 300 precast steel segments were linked together with high-strength steel cables to form the roadway. 4. Large concrete islands, called dolphins, were installed to protect the new bridge from ships. 5. The pipes were painted a brilliant yellow to reflect the colour of taxicabs in the Sunshine State. 6. Forty-foot-wide roadways run on either side of the cables and the design enables drivers to have a safe moving. 7. A violent thunderstorm destroyed a four-mile steel cantilever bridge. 8. The bridge was named after Bob Graham Sunshine Skyway. 9. Engineers designed the bridge to lift apr. 200 feet above the water. 1. Why is the Sunshine Skyway so popular and famous? 2. Why did building the bridge meet an opposition? 3. What was the main purpose to build the bridge after the war? 4. What can you say about the disaster in 1980? 5. What decision was made after the disaster? What would you have done if you had been a chief engineer? 6. What was the reason to use dolphins? What are they? 7. The Sunshine Skyway was renamed. After whom was it renamed? Why? Choose any 6 words and make sentences with them. The Forth Railway Bridge bridges the navigable channel called the Firth of Forth. The Sunshine Skyway bridge stretches over the Tampa Bay. The former is a bridge made of cantilevers projecting from piers and connected by girders, the latter is a variation of suspension bridge in which the tension members extend from one or more towers at varying angles to carry the deck. The connecting spans of the Firth of Forth bridge, which are sustained entirely by the main horizontal structure members supporting vertical loads by resisting bending they connect, are built minimally to be as light as they can be. To say about the Sunshine Skyway construction, more than 300 concrete segments ready for use were connected together with high-strength steel thick strong metal ropes to form the part of the road used by vehicles. Text 2. Bridge Construction (According to the Types). VI. Have you ever seen the bridges described in the photos? VI. Read the passage and answer the question: How has the classical drawbridge been improved? VII. Using the key words describe three ancient types of bridges.